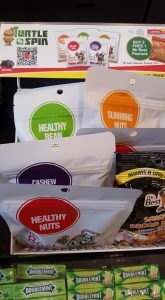 SLG Food Industries Sdn Bhd has introduced a new range of healthy snack nuts under the Mr Best label. The range comprises four variants – Healthy Bean, Slimming Nuts, Cashew Cranberry Nuts Mix and Healthy Nuts. They are available at MyNews.com convenience store in 70g pack. 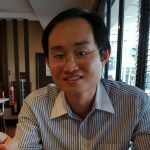 The interesting thing about the snacks are they include ingredients not commonly found in snacks such as goji, red dates and black melon kernel. The following are their ingredients. Slimming Nuts – Cashew nut, almond, dried figs, raisin, peanut and pistachios kernel. Healthy Nuts – Goji, raisin, almond, white pumpkin, kernel and black melon kernel. Healthy Beans – Cashew nut, almond, black soya bean and green soya bean. Cashew Cranberry Nuts Mix – Red dates, cranberry, raisin, cashew nut and peanuts. As consumers shift to healthy eating, the snacking market is increasingly moving towards healthy indulgence. Among the attributes of healthy indulgence are ingredients (dried fruits eg cranberries, colour (purple potato) and processing technique (baked). Mr Best new product has a clean design and the vibrant colours convey a fresh and healthy image. The 70g pack size also complements the existing common snack nut pack sizes of 30-40g and 150-180g. Unlike existing products in the market, the new range is opened to experimenting with goji (wolfberry), red dates and black melon kernel, making this range stands out in the crowded snack nut isles. The product description eg. 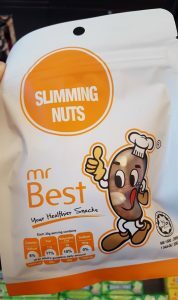 slimming nuts and healthy nuts has introduced consumers to a new approach of making their selection, which is based on functionality and less about taste.